Before she spent almost a decade working on progressive projects for the United Nations, like disarmament and human rights, award-winning investigative journalist Summer Brennan studied painting and poetry at Bennington. Her first book was about oysters and the fishing industry (The Oyster War: The True Story of a Small Farm, Big Politics, and the Future of Wilderness in America, Counterpoint, 2015). Her second is High Heel, for Bloomsbury's Object Lessons series. For my money, Object Lessons is the most consistently interesting nonfiction book series in America. Among the excellent variety of objects it considers, Nicole Walker's Egg (2017) has long been my most cherished installment. I'm pleased to report that Brennan's High Heel is my new favorite among the crowded field cultivated by series editors Ian Bogost and Christopher Schaberg. The first major pitfall she avoids is a classic bait and switch. Each book in the series is simply titled for the object it purports to discuss, but these are sometimes a bit of misdirection. For example, Paul Josephson's Traffic (2017) is more narrowly about speed bumps. There's a danger in choosing high heels for a subject, as the temptation would be to go too wide, rather than too narrow. Brennan is able to steer clear of a larger shoe discussion, offering only an occasional sentence here and there about the vast history of shoes just for purposes of context. Not only does she smartly avoid the broader detours it's possible to make in this regard, she's also able to steer clear of obvious targets within the narrow field of conversation about high heels. There are just two mentions each for designers Jimmy Choo, Manolo Blahnik and Christian Louboutin, any of which would serve extensively as kindling for an inferior book project. In place of an analytical or historical deep dive into these very prominent and unsurprising—and already well-trod, if you'll pardon the pun (Brennan also refreshingly skips the puns)—topics, the author subs in two other forms of nonfiction writing that showcase what the Object Lessons series can do when it's at its very best: memoir and epic poetry. Her firsthand observations of political life inside the United Nations building in New York City are wonderfully clear-eyed: "I sat in rooms with presidents and royalty, although to these people I was always, precisely, nobody. There was an image in my mind of a certain kind of woman—professional, feminine, poised—that I wanted to embody. I saw these women daily, year and year, backstage to the halls of power, on benches by the ladies' room, changing in and out of comfortable and uncomfortable shoes" (7). The pain of the high heel is a given. So is the price of wearing them—and of not wearing them. Brennan resists giving way to easy judgments on either side. She's inhabiting the same space as so-called "bad feminist" Roxane Gay, interrogating both sides of the high heel dilemma and refusing to declare a winner. This is possible in part because Brennan is operating on a model of identity politics that has not yet really proliferated into the way we talk about shoes: "On some level, all performance of female culture is drag" (19). Indeed! The essential question then revolves around to what extent our choices of footwear are our own. Brennan sometimes wants to wear high heels, but doesn't entirely trust that her desire isn't simply the product of cultural indoctrination. The dominant image of the book is this mentality, that "high heels are a choice" with consequences either way. It's in her effort to showcase these consequences that Brennan most utilizes a poetic sensibility. 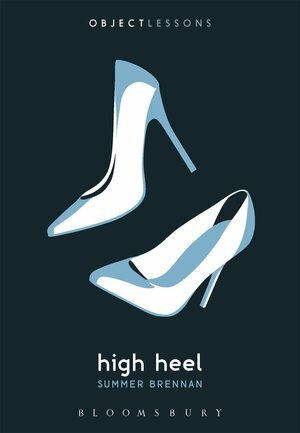 We don't generally think of nonfiction as a poetic terrain, but in the author's way of unfolding mythology and fairy tale, High Heel certainly ups the emotional ante of choice. Choice becomes metaphorized not as the proverbial two roads with one less travelled, but as a forest labyrinth far more daunting because of its ability to obscure the bleak prospect that there may only be one right road. Within this basic frame of tree and maze, the author excavates several myths and folktales. She recasts the stories of Daphne from Ovid's The Metamorphoses and other women with punished feet, such as Cinderella from the Brothers Grimm and the little mermaid from Hans Christen Andersen. L. Frank Baum's Dorothy also features, along with Ginger Rogers doing everything "backward in high heels" and poor Sylvia Plath who famously tired of that "black shoe / In which I have lived like a foot." Even before the Minotaur arrives to challenge "a goddess at the end of the world", as the last chapter is titled, the poetry of the myths bleeds into Brennan's political analysis, not unlike the blood pooling in the instep of Plath's high heels—at once bold and bald: "What confines, impoverishes, exploits, enslaves, oppresses, sickens, bloodies, rapes, and kills women are not generally clothes or shoes, but rather laws and societal norms. Prejudice. Misogyny. White supremacy. Transphobia. Homophobia. Predatory corporations and unfair labor laws. Discriminatory work and hiring policies. Lack of legal protection from violence in the workplace, home, and street. Non-enforcement of existing protections. Weaponized bureaucracy. Overpriced women-specific services. Medical sexism. Religious sexism" (109). The ugly, gorgeous litany carries on to a second page where it abruptly concludes with, "that is to say, systematically" (110). The lovely cadences stack up like so many sand castles that sift iconic examples of high heels into a finely grained pile of pros and cons that each reader will sift through quite differently. Personally, I have never worn high heels. Yet when I finished High Heel, there were several devotees of the heel in my life that I knew would enjoy reading this book. Whether you're for them or against them, the radical uncertainty of Brennan's take on high heels is worth reflection. High Heel is a properly modern consideration of what is at stake and it uses thoroughly intriguing methods of inquiry to approach a well-balanced lack of resolution.